Is the traditional way of thinking about pharmacy networks still the best way? In order to ensure better outcomes is it necessary to simply offer the largest number of pharmacy options? Some would argue that including fewer pharmacies in a plan’s network limits patient access, reduces adherence and negatively affects outcomes. But is that really true? Are payors paying for far more access than they need? 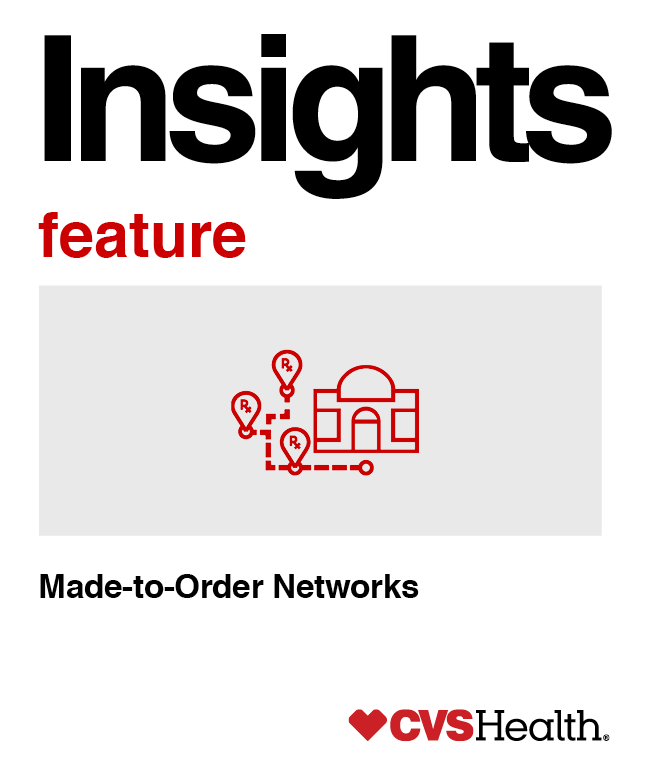 We think plans seeking to reduce costs and improve performance in today’s rapidly evolving market can – and should – be thinking about networks differently. With our managed network we focus on reducing redundancy, not access. And our research clearly shows that managed networks can help reduce costs for plans while delivering modest adherence improvements. This is because not all pharmacies have the same high level of performance related to adherence and other clinical criteria. So a network built around the best performing pharmacies can help drive desired outcomes. But why not take network strategy a step further? We believe that the future of truly innovative and effective network strategy lies in networks designed not just for a type of plan or segment of industry, but for unique plan needs. We are creating managed networks for our clients that will meet the unique access needs of a plan’s members while helping provide savings to payors. Review membership geography and distance to pharmacy providers to determine network composition. Consistent use of the same pharmacy to help support adherence, promote safety, etc. Customize your strategy to support your philosophy and goals. Say for instance, one plan has an urban member population located in areas well served by certain retail pharmacy chains and independent pharmacies. Another plan may have a predominantly rural population served by fewer pharmacies. Urban and rural members have different lifestyles, and travel and shopping patterns. The same network isn’t likely to effectively serve the needs of such disparate populations, because a pharmacy chain with coverage in urban areas may not have the same presence in rural areas. So we are building tailored networks based on geographic conditions, with additional pharmacies in the rural network. This helps ensure member access and helps provide lower costs through strategic negotiations specific to certain regions. A plan may have a combination of urban and rural members. In such cases, a unique, hybrid approach that looks at the overall member population and selects slightly different networks for different groups – urban and rural – within the same plan may be the right answer. When implementing a managed network, we focus on ensuring a positive member experience. We adopt a best practice communication strategy to keep members informed. We are also developing and implementing predictive models that help us deliver customized outreach minimizing member disruption. Members have different capacities to adapt to change. Based on 500 baseline characteristics, our model can help identify the likelihood a member will require additional support in making a transition. By doing this, we can precisely pinpoint which members would benefit from additional outreach and can help ensure a seamless transition. For clients that want to provide members with strong clinical support for better health outcomes to meet wellness goals such as adherence, weight loss, or to improve condition management, we can build a network around pharmacies – chains and independent – that support better clinical outcomes. For instance, CVS Pharmacy offers programs which help support a wide range of clinical needs with text reminders and pill bottle messages. Networks can also be customized based on a philosophy such as health and wellness. For instance, at CVS Health we believe that we can help deliver the first tobacco-free generation. That is why we made the decision to remove tobacco products from our pharmacies. Several other independent and retail chain pharmacies also have tobacco free locations. Many of our pharmacies also offer smoking cessation programs to help people quit. We believe in helping our people – our own employees and our client’s plan members – on the path to better health. So we are redesigning our pharmacies to give greater prominence to healthy snack items. Thinking about networks differently is somewhat of a tradition for us. The Maintenance Choice network was a pioneering step in this member-based approach. While research has definitively shown that 90-day prescriptions result in better adherence, it is also clear that most members prefer to have a choice about where to obtain their prescriptions, either through mail order or at a retail pharmacy. CVS Health Research Institute research shows that approximately 50 percent of patients choose to pick up prescriptions at a retail location rather than have medications sent to their homes. In addition, members who had a choice of where to obtain their prescriptions were 30 percent more likely to achieve optimal adherence. We have continued to evolve and invest in Maintenance Choice to ensure an ongoing seamless experience through our integrated model, which means every member receives the same high-level care and service, whether at a CVS Pharmacy location or our mail service pharmacy. Members can also access and manage all their prescriptions online or through our mobile app and seamlessly switch between retail and home delivery at any time. In addition, we offer payors who want to build on savings delivered by Maintenance Choice the option to layer on our Advanced Choice Network. Specialty Connect demonstrates equally strong results for patients. By allowing patients to obtain their specialty prescriptions either at retail or through home delivery, research has shown a 17.5 percent increase in the rate of obtaining a second prescription and 11.4 percentage point improvement in adherence. Whether they obtain their medication at mail or retail, members benefit from the same level of monitoring, support and clinical expertise and generally have the same out-of-pocket cost. Our clients have had notable success with our innovative network solutions so far. However, the pharmacy benefit market today is more dynamic than ever before. We continue to evolve our network strategy and develop innovative new solutions that help our clients not only keep pace but stay ahead of market changes. We will continue to share our approach and perspective with you in future issues. **Specialty Connect: where allowed by law. In-store pick up is currently not available in Arkansas, Oklahoma and West Virginia. Some states require first-fill prescriptions to be transmitted directly to the dispensing specialty pharmacy. Products are dispensed by CVS Specialty and certain services are only accessed by calling CVS Specialty directly. Certain specialty medication may not qualify. Services are also available at Long’s Drugs locations. Mail pricing at CVS retail for ERISA governed plans. The Maintenance Choice program is available to self-funded employer clients that are subject to ERISA. Non-ERISA plans such as insured health plans, plans for city, state or government employees, and church plans need CVS Caremark Legal's approval prior to offering the Maintenance Choice program. Prices may vary between mail service and CVS Pharmacy due to dispensing factors, such as applicable local or use taxes. Actual results may vary based on factors such as programs adopted by the plan. Client-specific modeling available upon request.